Carlton Reeves, U.S. Department of Energy, said big data is the key. Someday, a busy city intersection could be void of traffic signals and signs. No one will be directing traffic, either. Vehicles wirelessly interconnected with one another and with the intersection will communicate back and forth. Cars and trucks will slow down and speed up as needed to glide through what otherwise could be a traffic jam. With the merger of big data analytics, connectivity, changing driving habits, and bold thinking, vehicle transportation as we know it is changing—and rapidly. Ride sharing, car sharing, electric cars, connected and autonomous vehicles, real-time traffic information, multi-modal transportation solutions, and smart parking are either here or on the horizon. That was the theme at the Innovations in Transportation Conference, August 16 in Ames. About 200 transportation professionals attended the meeting sponsored by the Iowa Department of Transportation and the Iowa State University Institute for Transportation (InTrans). Emerging technologies will make driving safer, more economically efficient, and more environmentally friendly and will increase mobility for more people, speakers explained. Driverless cars may someday allow a lone occupant to sit back and read a book during the morning commute, relying on a range of high-tech sensing, orienting, and processing systems to keep the car safely on the road to its intended destination. The cars could even park themselves after dropping occupants off at the door. 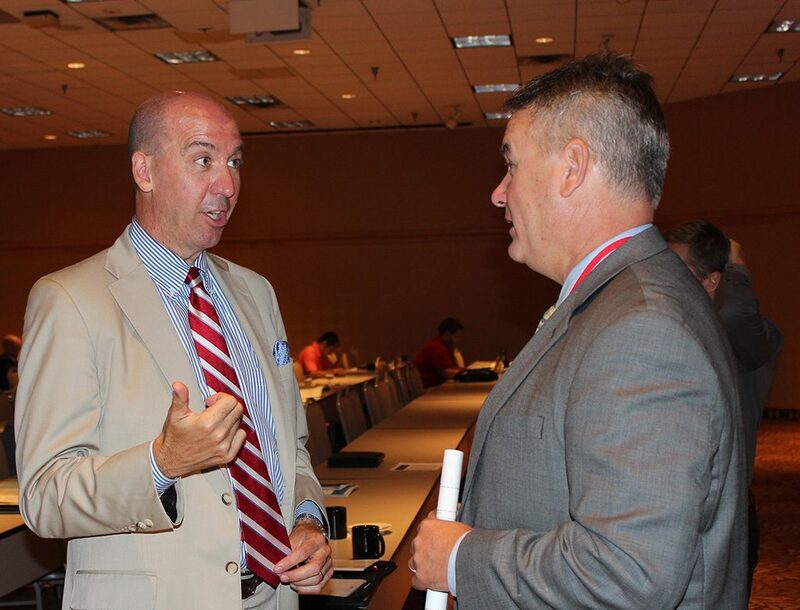 Keynote speaker Jack Uldrich, left, visits with Neal Hawkins, ISU Institute for Transportation associate director. Ford Motor Company’s Kevin Cooper told conference participants his company is “aggressively pursuing emerging opportunities.” Cooper, Ford’s Smart Mobility Analytics Manager, said Ford plans to be a leader in connectivity, mobility, autonomous vehicles, the customer experience, and data and analytics. A major key to the evolution is the availability and analysis of big data. Carlton Reeves of the U.S. Department of Energy said big data and technology are helping to “reimagine how we move people and goods.” Reeves, technology-to-market advisor for the Advanced Research Projects Agency-Energy, said a U.S. DOT report indicated the amount of global data generated is expected to grow by 40 percent annually. The Federal Highway Administration is working on the emerging technologies that impact safety, mobility, and the environment, said speaker Taylor Lochrane, a researcher for the FHWA’s Office of Operations Research and Development. He said congestion and system inefficiency are reaching critical levels on America’s roads. Lochrane cited three challenging statistics for the FHWA: 32,675 highway deaths in 2014, and 6.9 billion hours of traffic delay and 3.1 billion gallons of wasted fuel (adding 56 billion pounds of additional carbon dioxide to the atmosphere) annually. “Technology convergence will revolutionize transportation dramatically, improving safety and mobility while reducing costs and environmental impacts,” he said. He referenced the U.S. DOT’s Smart City Challenge grant, which was awarded to Columbus, Ohio, this year. The goal is to define a “Smart City” that integrates innovative technologies, including connected and self-driving cars and smart sensors, into its transportation system. “We really have to join with partners we haven’t partnered with in the past,” said Terri Johnson, who manages government sector projects for the Traffic and Connected Driving division of HERE, a transportation data supplier. She explained transportation’s next generation will see collaborations of, for example, car makers, DOTs, cities, insurance companies, data suppliers, manufacturers, university researchers, and software developers. ISU”s Institute for Transportation administers 15 centers and programs that are leaders in transportation research, outreach, education, and workforce development.